The low glycemic diet – is it a genuine way to lose weight and keep it off, or just another fad? The low GI diet has become a popular choice in recent years, not least because of exposure given to it by high profile celebrities such as Oprah. There is definitely real value behind the idea of the low GI diet because unlike many fad diets, it’s grounded in scientific fact. In short, the effectiveness of low GI diets spring from the way your metabolism processes different types of foods. How the low glycemic diet works and how it is related to weight loss. How the glycemic load differs from the glycemic index (GI) , and why it can it can sometimes be more important than the glycemic index. A general rule of thumb when it comes to assessing the GI of food categories such as vegetables, fruits, nuts, meat, eggs and dairies. Tips for making low glycemic eating easier and how easily identify high glycemic foods. What Exactly Does the Glycemic Index Mean? The glycemic index is effectively a measure of how quickly certain types of food will cause a rise in the blood sugar. The measure is largely based on the type of carbohydrates in the food you eat. 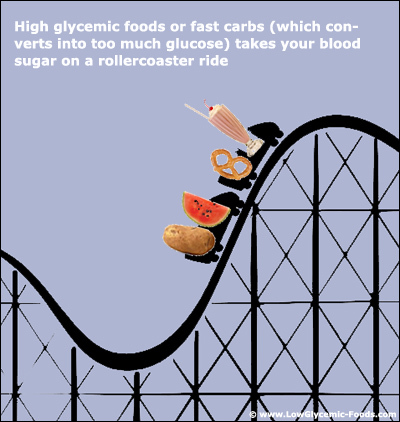 All carbohydrates will produce changes in blood sugar levels, but some cause a slow steady rise whereas others cause a sudden spike. Those that have a slow, steady effect on blood sugar are low glycemic index foods, and conversely, those that cause rapid spikes are high glycemic index foods. Anything under 55 on the scale is considered low glycemic foods – this number is not the same as the glycemic load of the food, though, which we’ll discuss more in a second. The moderate zone is between 56 and 69, with 70 to 100 being the high GI zone. The goal of a low glycemic diet is to fill your plate with as much food that falls into the 55 and under zone as possible, while doing your best to restrict high glycemic foods to small, infrequent quantities. So we now know that low glycemic foods have a slower effect on blood sugar levels than high glycemic foods – but how exactly is that relevant to weight loss. Well, it all comes down to the effects these foods have on your appetite and energy levels. Generally speaking, low GI foods will fill you up more and leave you feeling satisfied (in other words, not hungry) for longer periods of time. It’s the hits of sugar from high glycemic foods, followed by a quick crash in blood sugar levels that often lead to eating binges. So eating low GI foods helps you avoid the desire to binge-eat, making fat loss much easier. In a way, the idea is to use ‘smart eating’ to eliminate your body’s craving for the foods that make you fat. Eating the types of food that keep you feeling full and energetic for long periods of time without overloading yourself on calories, will help ensure you end up with a natural calorie deficit – in other words, even though you’re eating plenty, you’ll be burning more energy than you take in, even without much effort or exercise. The result: your body will be forced to burn fat to make up the energy difference, and that’s how natural, healthy fat loss happens. One of the most important things to understand when it comes to dieting is that not all calories are created equal. You can eat the same number of calories in the form of a high GI food or a low GI food – the difference is, the high GI food is likely to leave you feeling hungry again fairly quickly, which will lead you to eat more, and that’s how the ‘downward spiral’ of over-eating gets started. So it’s important to understand how to control your blood sugar levels through wise eating choices, and, as a result, controlling your hunger levels to a significant degree. We’ve already touched on glycemic index – the measure used to let you know how much a food will raise your blood sugar levels. Let’s take a closer look at exactly what determines a food’s glycemic load, because it’s important to know the difference between a food’s glycemic index rating and glycemic load – they aren’t the same thing. The glycemic index tells you generally how quickly your body will absorb a food and the effect it will have on blood sugar – the problem is it doesn’t take into account serving sizes. That’s where glycemic load comes in handy. In other words, it’s not just about the type of carbs in the food, nor is it only about the amount of carbs – it’s a combination of both! So it takes into account the size of the type of serving you’re eating. Orange juice weighs in with a glycemic index rating of 50, with a glycemic load of 12 for a typical 250ml serving. 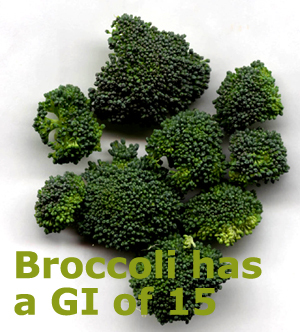 Broccoli only comes in at 15 on the glycemic index, with a glycemic load of 1 for a typical serving. (Those numbers – 12 and 1 – might seem awfully close at first, but with glycemic load anything under 10 is low, 10-20 is medium and 20 plus is high). You can actually work out the glycemic load of a food yourself if you know its glycemic index and the proportion of the food made up of carbohydrates. Because glycemic load measures both quality and quantity, these are the factors you need to know – glycemic index gives you the quality (i.e. it tells you whether you’re dealing with ‘fast’ or ‘slow’ carbs) and you can then work out the rest based on serving size and how much of the food is made up of carbs. Multiply the GI number by the number of carbs per serve, then divide the total by 100 and voila – you have the food’s glycemic load. The glycemic index was actually originally developed for diabetics, for whom control of blood sugar levels can be a matter of life and death. ‘Glycemic control’ is a term which is most often used in relation to diabetics, but the concept does have some application to dieting. It simply refers to keeping blood sugar levels within a ‘safe’ range. In diabetics this is done not only through diet but also with insulin injections. For dieting purposes, the goal is to simply keep your blood sugar balanced through sensible eating, avoiding large spikes that come from large intakes of simple carbs (basically sugars). Using a chart takes a lot of the guesswork out of glycemic dieting, and will also help you avoid some of the foods that don’t quite fit in where you’d expect them to on the glycemic scale. It’s best to use a chart which includes not only the glycemic index of foods, but also typical serving sizes and glycemic loads. Remember – glycemic load is what really matters most, because glycemic index on its own doesn’t take into account the quantity of food you’re eating. Glycemic index charts are usually organised by different types of foods, such as breakfast cereals, fruits and vegetables, and so on. A good chart should also include food additives such as table sugar – remember, these can have a big impact on the amount of carbs you’re actually taking in. Some low glycemic dieters attempt to ‘cheat’ by eating low glycemic foods covered in extra table sugar. This is a recipe for disaster – you need to count everything you eat as part of your intake, including extra sweeteners, juices and sauces. So far we’ve covered a lot of the theory behind the low glycemic diet – but what about some actual solid, practical tips you can use to start implementing diet changes and experiencing the real life results? With further ado, let’s turn our attention to some of the best foods you can include in a low glycemic diet plan. Many people mistakenly assume that bread, and breakfast foods such as cornflakes, are low GI. But this is not the case. Again, this is where understanding the difference between complex and simple carbs – otherwise known as ‘slow’ and ‘fast’ carbs – becomes important. As a general rule, simple carbs are absorbed quicker and result in spikes in blood sugar – they are the ‘fast carbs’ which push foods towards the high end of the glycemic index. Complex (slow) carbs are absorbed more slowly, provide lasting energy and generally leave a food closer to the low end of the glycemic index. For example, broccoli contains a lot of fiber and slow carbs. This means it digests slowly, releases energy slowly and is filling for a lot time. By contrast, most bread and breakfast cereals contain simple carbohydrates which provide a quick energy hit and a spike in blood sugar – this is why breads and cereals are typically between 80-95 on the glycemic index. Broccoli, celery, cabbage, mushrooms, spinach and green beans – cooked correctly, all of these foods effectively have a GI far below the 55 limit of low glycemic foods. Vegetables should be steamed or boiled for the best results. If you’re going to fry things, use an oil (e.g. olive oil) which is high in unsaturated rather than saturated fats. When it comes to snack foods, throw away the candy or high-sugar muesli bars and start buying nuts. In particular unsalted peanuts are a good choice, with a GI of 14-22. Almonds, macadamias, pecans and walnuts all have a very low glycemic index of about 15, so if you’re feeling peckish – just go ahead and dig in. 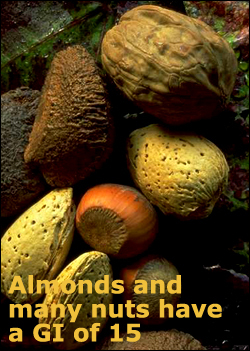 Nuts are high in healthy protein and are thus a great way to stay feeling full between meals. Nuts give you the little extra bit of energy you need without giving you the desire to binge that you’d get from a high GI food. 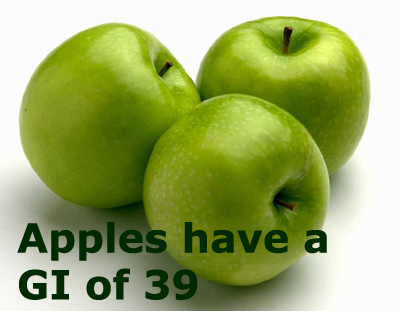 When it comes to fruit, there is a lot of variation and you can’t always assume fruit equals low GI. Fruits, in general, tend to contain more sugar than vegetables. It may come as a surprise to learn, for example, that watermelon has GI of 72. Pineapple is also high on the index, with a rating of 66. Grapefruit, plums, apples, pears and peaches are a few fruits towards the lower end of the index, all falling within the 20-50 range. Again, though, remember to take serving sizes into account. It’s also important to remember that while the glycemic index focuses on carbs and blood sugar, carbs do not exist in a vacuum – you also need good levels of protein, fiber and good fats in order to maintain a healthy diet and get the best weight loss results. 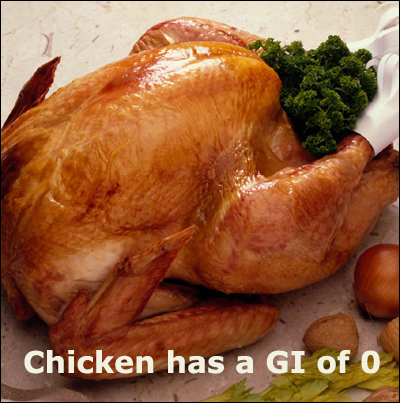 Most meats come in at a 0 on the glycemic index because they are made up primarily of protein and fat. This is another place where low glycemic dieters can trip up – however, just because a steak has a GI of 0, doesn’t mean you can spend all day eating nothing but steak and still lose weight. GI is about carbs, but you also have to be careful to balance other dietary factors such as your intake of saturated fats. Stick to lean, low-fat meats such as skinless chicken breast, fish, turkey and low-fat beef. 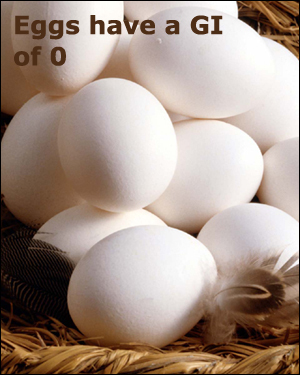 Eggs are a good addition to a low glycemic diet too, in small quantities. Researchers are divided on ‘safe’ levels of egg eating due to their cholesterol content, so if you’re worried about cholesterol it’s best to keep egg intake to no more than one per day. However, you can also simply just remove the yolks – the white of the egg contains most of its protein content, whereas the yolk contains virtually all the cholesterol. Most dairy products have a GI of 30-50, although ice cream tends to be particularly high on the glycemic index. Just knowing about glycemic charts and popular glycemic foods isn’t always enough to ensure success with a low glycemic diet. There are some other practical tips you should keep in mind. For starters, be very careful about keeping high glycemic foods lying around the house. You’re best to clear them out altogether, at least for the first month or two, so you aren’t tempted by them. Yes, low GI foods fill you up more and after a solid low GI meal, you won’t be craving chocolate – but what about when you wake up in the morning on an empty stomach? Treats are fine – in fact they are encouraged, occasionally – but buy them in small quantities and then eat them straight away, don’t leave them lying around the house. During the week your cupboards and fridge should be stocked 95% with low GI foods to avoid temptation. For example, you’ll be amazed at how many foods you probably eat on a regular basis have a high content of high fructose corn syrup. Keep an eye out for this ingredient and steer clear of processed foods which contain it. A good dose of early morning protein helps level out blood sugar and will help keep your energy levels and appetite in check for the rest of the day. Although most vegetables are in ‘safe’ low glycemic diet zone, be aware that some vegetables are actually close to the top of the scale when it comes to the glycemic index. Carrots, potatoes and parsnip, for example, are all around 80 plus on the index. However the carrot is tricky because even though it has a high GI, it has a low glycemic load of 3 – meaning that, yes, sugar is released quickly into the bloodstream, however, the sugar content is so low, that the overall effect is minimal. These are typically packed with sugar and are usually 70 plus on the glycemic index. The same applies to soda drinks like Coke and Fanta. In general, it’s a good idea to avoid caffeinated drinks, alcohol and smoking as much as possible if you want to get the best results from your weight loss diet. (And whatever you do, don’t try to use smoking as an appetite suppressant! A good low GI diet will keep your appetite under control without any of the health risks of smoking). This is to be applied to carb-rich foods, of course – eggs, for instance, don’t count. This basically means avoiding foods like potatoes, white bread, tortillas, white rice, salt and sugar. If you’re going to be adopting a new diet for weight loss, it’s highly recommended that you start and exercise regime as well, as it’s very difficult to get optimal weight loss results from diet alone. So there you have it: a comprehensive introduction to the theory, practice and benefits of the low glycemic diet. Remember to keep in mind the difference between glycemic index ratings and the glycemic load of the food you eat. Have fun finding your favorite low GI foods, putting together your own low glycemic recipes and enjoying all the benefits that will follow if you stick with a well-balanced low glycemic diet.